Formed in February 1982 by a group of teenage girls who'd just left school. Note lack of guitar player in the lineup. Early influences cited by the band included Siouxsie, The Cure, Grace Jones and the B-52s. They later drew comparisons to Eurthymics and the Psychedelic Furs. They recorded a demo in 1983 under the guidance of Gerry Lane (Driveshaft) which was produced by Denis Herlihy at Ballinadee Studios in Bandon. This included the tracks "Illusions" and "Bitter Sweet". Their live set included a clever rearrangement of "Downtown". Porcelyn Tears recorded several more demos and did three Fanning sessions on RTE radio, the first in early 1984. They also made various TV appearances (TV Gaga, Anything Goes). A single was recorded at Windmill Lane with Joe O'Herlihy and planned for release in May 1984, but for whatever reason this never came out. They did not get an easy ride from the press. They were portrayed as an amateur wannabe pop-star girly group. 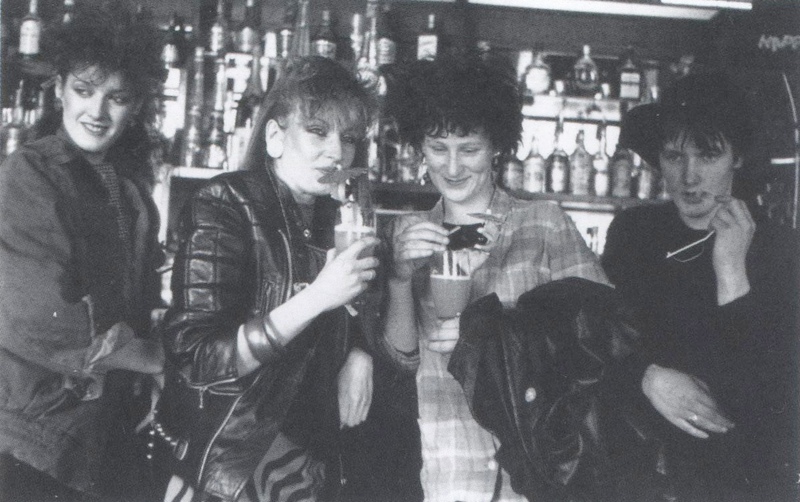 George Byrne described them in Hot Press in 1985 as "the most sexist outfit touring [the] country", suggesting they relied on their looks rather than talent, suffered from one Grace Jones video too many, and that Ann Redmond "spent more time scouting for flashbulbs than concentrating on her vocals". He concluded that they may be photogenic but their songs were appalling and their musicianship even worse. It's safe to say George didn't like them. Gerlyn Ryan was replaced by Kamla Das (ex Expresso Mambo) at some point. They supported U2 at the Lark By The Lee in 1985 and New Order on their 1985 Irish tour. Management problems led to their demise. Ann Redmond formed The Chapterhouse with Skully of Real Mayonnaise.